Turn up the volume on weeknight dinners with something easy, but tasty, like prosciutto wrapped chicken or prosciutto wrapped pork loin. This Saltimobocca Alla Romana recipe is a classic dish that utilizes pantry staples with just a few key ingredients. The flavor of the prosciutto seeps perfectly into the meat of your choosing, and the buttery sauce adds a richness that will surely excite your taste buds. Pair this prosciutto wrapped chicken dish with an Italian red wine and some sautéed greens, and you’ll have a restaurant quality dinner in no time. Top each cutlet with a slice or two of prosciutto, trimming to fit. Secure two sage leaves onto each cutlet on top of the prosciutto using toothpicks to pin them in place. Dredge cutlets in flour; shake gently to remove excess. 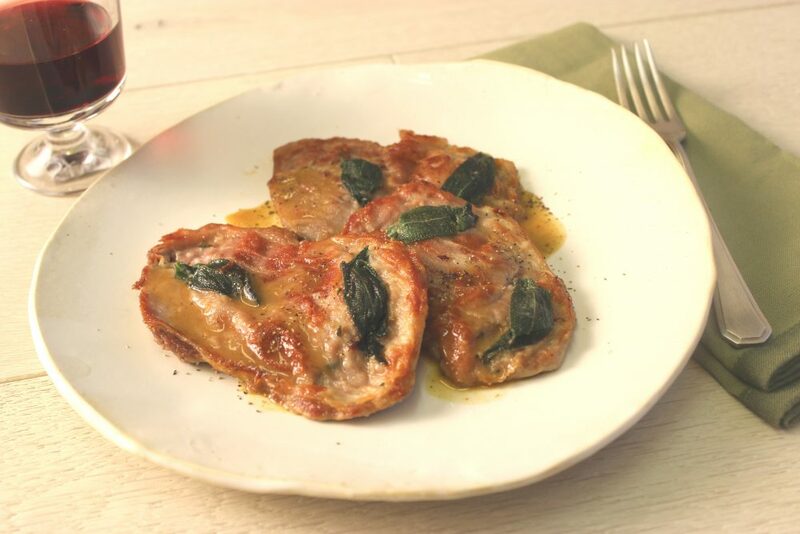 To make the saltimbocca, in a large skillet heat 2 tablespoons of the oil and 1 tablespoon of the butter over medium-high heat. Add a few of the cutlets prosciutto-side-down to the skillet. Sprinkle with pepper; cook, until browned on the bottom, about 2 minutes. Turn; cook until the other side is browned, about 2 minutes more. Repeat with remaining cutlets. Add additional oil to the skillet, if necessary. Transfer veal to a platter; cover lightly to keep warm. Crumble the chile with your fingers and add to the pan. Add wine; stir to scrape up any brown bits. Add any juices from the resting veal. Cook, until wine is evaporated by half. Stir in the remaining tablespoon butter until melted. To serve, place on individual plates and remove toothpicks; strain sauce and pour over the saltimbocca. Looking for the perfect beer or wine to pair with this dish? Check out our beer and wine pairings pages to learn more.